Morocco is poised to adopt a new comprehensive policy on immigration as the country is hosting increasing numbers of immigrants, mostly from sub-Saharan Africa. The adoption of this new comprehensive policy on immigration was discussed at a meeting held on Tuesday under the chairmanship of King Mohammed VI and in the presence of the Head of Government and several cabinet member and senior officials. During the meeting, the King instructed the Government to immediately start working, in coordination with the National Human Rights Council (CNDH) and other stakeholders, on a strategy and an appropriate action plan, the aim being to come out with a comprehensive policy on immigration, the King’s office said in a statement. King Mohammed VI deems that such a move will endow the Kingdom with the right tools to play a prominent and an active role in the regional and international scene in terms of migration management, the statement said. The King had received on Monday a CNDH report on the situation of migrants and refugees in Morocco and had then called for a comprehensive and humanist handling of migration-related issues, which are a source of concern and sometimes polemics in the North African country. The CNDH report lists a number of recommendations to protect migrants’ rights, and calls, inter alia, for implementing a genuine public policy, based on international cooperation and involving the civil society. For the CNDH, this public policy must focus on four major fields: the situation of refugees and asylum seekers; the situation of foreigners whose administrative status is not regularized; the fight against trafficking in persons; and the situation of aliens legally settled in Morocco. The CNDH also recommends adopting a policy of integration of the refugees and their families in terms of housing, health, schooling, training, employment and family reunion. The document which insists on the key role of international cooperation in enacting such a policy urges the government to upgrade cooperation and partnership with the High Commissioner for Refugees. Morocco, which was in the 60s and 70s a country of emigration, with Moroccans settling in Europe, has gradually become a host country for migrants. Internal strife, recurrent droughts and economic hardships in a number of sub-Saharan African countries have driven growing numbers of Africans out of their homelands, with most of them seeking to reach Europe. As border controls at the gates of Europe grew tighter, these immigrants find themselves stranded in North African countries, living on petty jobs, begging, and sometimes delinquency. 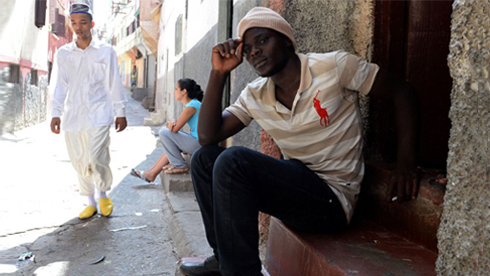 In Morocco alone, the number of immigrants from sub-Saharan African countries has quadrupled over the past few years. According to figures compiled by associations, there are currently some 20,000 illegal migrants in Morocco. The North Africa country has also experienced lately, as a result of the global economic crisis that hardly hit Europe, a new form of immigration from countries such as Spain, France and other European countries. The King insisted in this regard on the need to regularize the situation of immigrants, be they from sub-Saharan Africa, Europe or elsewhere, through providing them with residence and work permits. It has been noted however that Morocco cannot provide decent living conditions, jobs and economic and social integration to all migrants wishing to settle in the country, the King’s Office statement said. Actually, the number of illegal immigrants entering Morocco mainly from the Eastern and Southern borders is considerably increasing and some groups of illegal migrants want to force their way into the Moroccan territory at any cost. This sometimes leads to clashes with law enforcement forces that result in casualties on both sides. Likewise, the King has repeatedly stressed the need to relentlessly fight human trafficking and human trafficking networks. All these instructions, recommendations and initiatives reflect the Moroccan ruler’s keenness and involvement in the protection of human rights in accordance with the provisions of the Constitution, the requirements of the rule of law, and in accordance with Morocco’s international commitments.